Letâs be blunt: If you had to pick, say, three or four likely Western Conference participants in the Stanley Cup Finals, the St. Louis Blues will be on that list. This team is loaded. Number 2 overall in terms of goals for means they can score in bunches. Number 7 overall in terms of goals against means that they have a top tier defense. The team is coached by former Columbus Blue Jackets bench boss Ken Hitchcock, a likely Hall of Fame coach who has propelled the Blues from perennial underachiever to, well, Stanley Cup contender. The Blues have two ridiculously good scorers in Alex Steen and David Backes, who have a whopping 37 goals between them thus far. Their resident pest, T. J. Oshie, has 23 assists as well. Itâs hard not to look at their stat sheet, frankly, and just sit back in your chair in amazement. Weâve talked about elite hockey teams â Pittsburgh and Boston being chief among them. This is most definitely in that class, if not higher â for the Blues are winning their 20-plus games in the ridiculously difficult Western Conference. As a point of comparison, only Ryan Johansen (25 points) would crack that list from the Columbus Blue Jackets roster. Wow. And despite the gaudy scoring numbers, remember that Ken Hitchcock is known not for his offense but for his incredible team defensive schemes. Jaroslav Halak has been the workhorse at goal, with 22 starts, a 15-5-2 record and a .910 save percentage. Heâll get the start tonight. Backup Brian Elliott is 6-1-1 in eight starts and has a .913 save percentage. Weâre back in the soap opera world of NHL hockey, what with the âsubplotsâ of Hitchcock facing the Blue Jackets once again and former Blues president John Davidson and former Blues assistant general manager Jarmo Kekalainen leading the Blue Jackets against their former team. Personally, Iâd be surprised if these stories carry through past the puck drop, what with Hitchcockâs former management being swept out of Nationwide Arena and the fact that former executives animus (if there is any) toward their old team just doesnât manifest itself well through the roster outside of JD giving the pregame talk in the locker room. Whatâs REALLY important, in my opinion, is to look at this game as a measuring stick for Columbus. The Blue Jackets are 6-4-0 in their last 10 games, but none of those wins were against teams like the Blues. So weâll know by about 10 oâclock tonight what we have on our hands as Blue Jackets fansâ¦and whether this team truly has turned the corner. Goaltender Mike McKenna â he of the forty whole minutes of NHL hockey this season â gets the start due to injuries to Sergei Bobrovsky and Curtis McElhinney. Obviously heâs going to have to play a very strong game. Heâll also require heaping piles of help from the CBJ blue liners to minimize the quality and quantity of shots from the potent St. Louis roster. But the guy Iâm really going to have my eye on is center Ryan Johansen. Johansen has been on fire of late, jumping up to 25 points on the season and pulling out all sorts of crunch-time heroics. I canât see any NHL coach looking at tape of the Columbus Blue Jackets and not saying, âWe have to stop number 19.â Because in all seriousness, shutting down Johansen means that the CBJâs top scorer and one of their top playmakers is neutralized. While coach Todd Richards and his staff can try to counter-scheme to free up Johansen (last line change from being a home game is an obvious advantage), Johansen and his linemates will have to do the heavy lifting out on the ice to keep his seven-game point scoring streak alive. 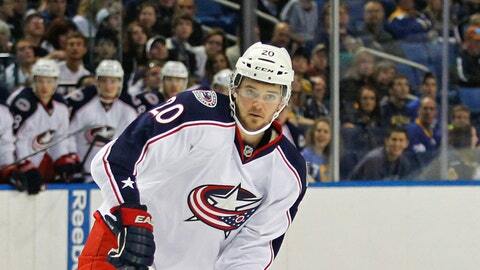 – Youâll get the latest âBlue Jackets Slap Shotsâ as an appetizer at 6PM. – The Blues and the Blue Jackets face off at 7PM with Jeff Rimer and Bill Davidge on the call. – âBlue Jackets Live Postgameâ with Brian and Dan starts immediately following. – If you tuned in late or are looking for another dose, it also appears that âSlap Shotsâ will air following the postgame show, right around 10PM. Have fun tonight! Go Jackets!